Heat oven to 400°F. Grease bottoms only of 6 regular-size muffin cups with shortening or cooking spray, or line with paper baking cups. In medium bowl, mix flour, 1/2 cup oats, the baking powder and salt. In small bowl, mix brown sugar, milk, oil, vanilla and egg with fork or wire whisk until blended. Stir milk mixture into flour mixture just until flour is moistened. Fold in apricots. Divide evenly among muffin cups. Sprinkle each with about 1/2 teaspoon oats. Bake 23 to 25 minutes or until toothpick inserted in center comes out clean. Remove from pan to cooling rack. Serve warm or cool. 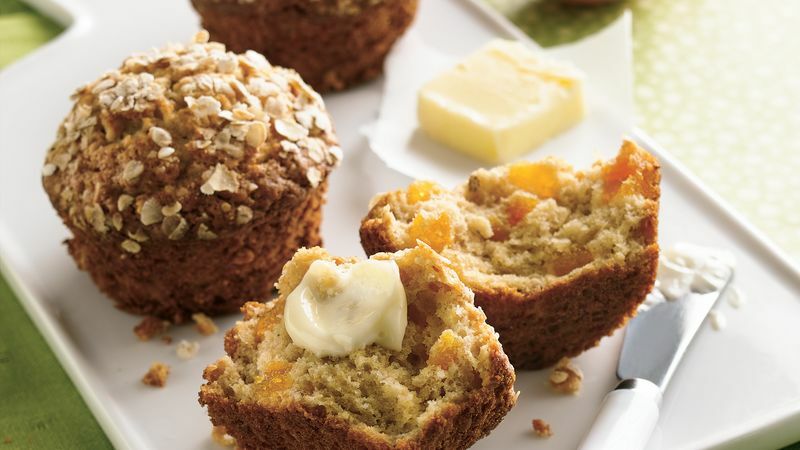 To avoid soggy muffins, take them out of the pan immediately after removing them from the oven. Use an ice cream scoop, if you have one, to add batter to the muffin cups.